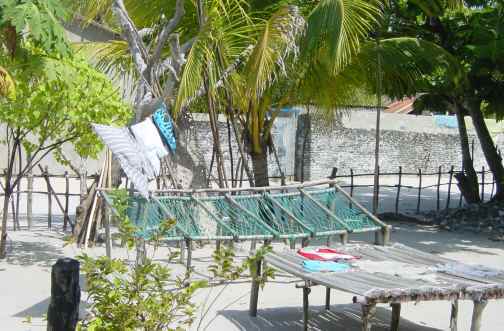 The Maldives are reminiscent of the South Pacific Islands with clear waters, gentle breezes, and white sandy beaches. 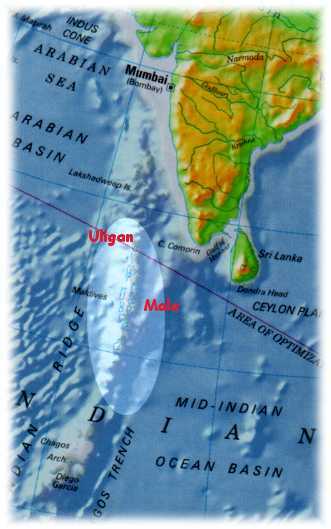 We only managed to touch the northern tip of the island chain at Uligan and found the people hospitable and honest if a little aloof from the cruisers. 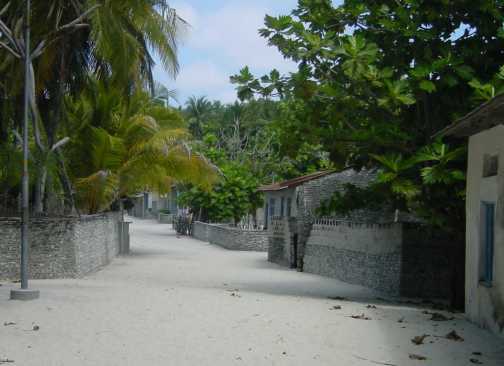 The Maldives is like a string of pearls - 1192 islands and atolls, none more than 6' above the sea level. The country stretches 600 miles north-south with no island more than a couple of miles long as it dangles below the Indian sub-continent. Curiously it is an Islamic enclave in a mostly Hindu part of the world but that seems to have served its people well for hundreds of years. Most people live by fishing and the average income is quite low. Some islands have been turned into high class resorts for well-heeled tourists seeking seclusion, white beaches and clear water. Most islands are off-limits to cruising yachts, but Uligan, in the northernmost atoll is on the most-frequented route for circumnavigators on their way from Asia to the Red Sea, and so the country has made this a port of entry. It is a beautiful spot and a nice break on the path from Sri Lanka to the Gulf of Aden. The authorities operated the most professional reception and check-in procedure we have encountered in 10 years of cruising - quick, courteous, clear forms, crisp information on do's and don'ts while in Uligan, and clear check-out procedures for when that time comes. The people on the island were hard to get to know - the 2 merchants who catered to cruisers made an effort to greet us, but most people politely walked past, sometimes smiling, but pointedly avoiding close contact. We were invited to a dinner put on by the locals, and a few of the young men came down to chat during our only social time together while at Uligan. All were camera-shy, and thus pictures with locals were hard to come by. All in all, we enjoyed the stop, but the scenery was similar to the S Pacific and the people were not as outgoing and we did not feel that we absorbed much of the local culture during our 8-day stay. Our next stop was to be Oman, our first in the Arab world as the drums of war rolled in the United States as they threatened in invade Iraq.